Visualization is a great memory technique as long as your mental pictures are clear. But what if you have trouble seeing images in your mind's eye? The solution is memory cartooning. Sketch your mental images on paper! You don't need artistic skill to draw these cartoons. As long as you understand what you've drawn, your quick sketches can be a powerful memory aid. Visualization means to perceive an image in your mind. Sketching memory cartoons means to physically draw that image on paper. Drawing the image extends the visualization and association memory technique a step further, from your mind onto paper. Medical student Gabrielle Schaefer described on FutureDocs Blog how she used cartooning to memorize symptoms of Hurler's disease. Her image is a gargoyle with clouds for eyes, hurling a ball. Hurler's disease causes gargoylism and clouded corneas. Gabrielle's sketch connects symptoms with the name of the disease, in a visual way. The stuff I made memory cartoons for is in the vault! Now those Hurler's disease facts are solidly in her permanent memory, easily and accurately recalled. The name of the disease triggers the memory of her cartoon image. The content of the image gives her the symptoms of the disease. Recall works the other way, too. Mention of the word "gargoylism" causes the same image (with its embedded associations) to pop into her mind. Like mental images, memory cartoons link facts visually. The following explains how to brainstorm an image. Besides the drawing itself, the steps are the same whether you only intend to visualize your image, or go a step further and sketch a cartoon. Direct Representation. Imagine objects or actions that directly represent the fact you want to remember. Gabrielle took this approach. In her cartoon, clouds represent "clouded corneas", a hurling (throwing) action represents Hurler's disease, and a gargolye represents the medical condition gargoylism. Substitute Syllables. Imagine objects or actions that sound like the syllables of the fact you want to remember. Gabrielle provided an example of the first method. I'll give you my example of the same method, plus an example of the second method. In a given situation, you can choose the method that lends itself better to the material. This method is fairly easy and quick and very helpful for memorizing simple information. For instance, today I was helping someone with their math homework. The math number "e" (e = 2.71828...) came up. It's an irrational number named after mathematician Leonhard Euler. I assumed Euler's name is pronounced like this: YOO-ler. But it turns out the correct pronounciation is this: OY-ler. I decided I wanted to commit that simple fact to memory. But how? First, I noticed that OY-ler sounds like "oiler". That is, the sound of his name reminds me of "oil". So I picked up a pen and quickly sketched an oil derrick spewing out a gusher of oil -- with the twist that the oil is filled with "e's" (see image above). 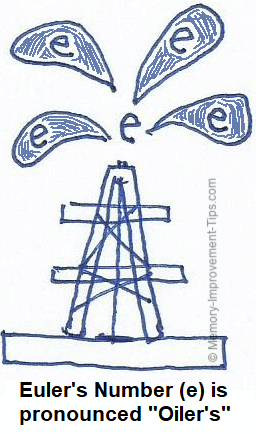 Now whenever I think of Euler and his invention of the irrational number "e", the image of the oil derrick with "e's" coming out of it will remind me of the correct pronounciation. Why go to the trouble? Well, for about 5 minutes of effort, I've made sure I'll never forget that one small fact. That's worth it to me. That's my memory cartoon for the definition of ikigai. How did I decide on that particular image? I used substitute syllables (method #2) to imagine objects that represent the syllables of the word ikigai and its meaning. To me, the syllables of ikigai sound like "geeky guy". And the key word "purpose" in the definition sounds like "porpoise" (dolphin with a short beak). So I linked "geeky guy" and "porpoise" into a single weird image, a geeky guy riding a porpoise! And to make sure I know that ikigai is Japanese, I included Godzilla riding on the porpoise's tail. My memory cartoon for ikigai is already strange, but I could have made it even more memorable. I could have increased the size: a geeky guy riding a gigantic porpoise. Or increased the number: a thousand geeky guys riding a thousand porpoises. TIP: Make your images funny, exaggerated, or bizarre. The ordinary is forgettable. Your brain remembers unusual things best. Now when I quiz myself, "What's the Japanese word meaning purpose or reason for being?," the key word purpose in the question triggers the memory of my porpoise cartoon. 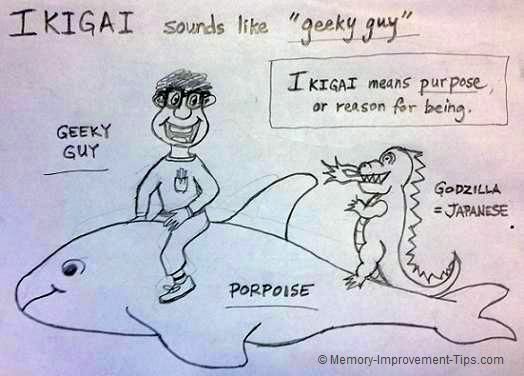 I recall the geeky guy riding a porpoise, so the word I want to remember must be ikigai. I drew the ikigai cartoon more neatly than necessary. Make your sketches quickly. You should knock out a memory cartoon sketch in a few moments. Here's an example of a more typical memory cartoon, a simple fast sketch. For memorization purposes, a quick drawing can be just as effective (sometimes more effective) than a fancy one that takes a lot of time to make. This picture helps me remember the translation of tenemos, a Spanish word that means "we have" (first person plural of the verb tener). Pointing at his fish tank, one stick figure says to the other, "We have ten Nemos." The word tenemos sounds to me like "ten Nemos". (Nemo, the clownfish in the Pixar movie of the same name.) 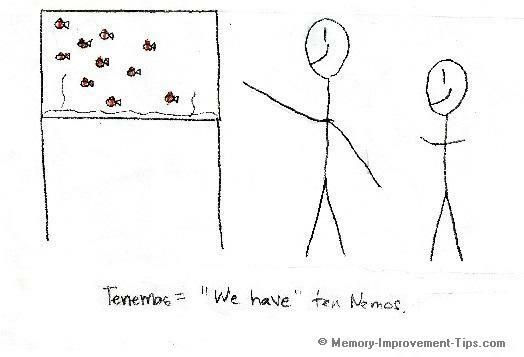 So the phrase, "We have ten Nemos", shown visually by this memory cartoon, reminds me that tenemos means "we have" in Spanish. To be sure I remember that tenemos is Spanish and not some other language, I could have added a sombrero to one of the stick figures. Is Memory Cartooning Worth the Effort? You forget more of what is memorized by repetition alone. Rote memorization does not provide a "mental hook" for retrieving the information. A mental image, on the other hand, includes clues that help you recall the facts. Rote memories are relatively weak. They engage a single memory pathway through the left brain. Mental images engage two memory pathways, through both the left and right brain. When you fail to recall something, it's often not because the details are missing from your brain. Rather, you've failed to locate the information in your memory. Ever said, "It's on the tip of my tongue"? You recognized that you knew the answer. You just couldn't fish the information out of your brain. Mental images and memory cartoons act as mental hooks for pulling information from memory storage. They establish strong mental associations between known facts. When you encounter important facts you want to remember, take a moment to associate them in a mental image, then sketch that image as a cartoon on paper. Memory cartooning is a fun and effective way to lock what you want to remember in your memory, especially if you tend to struggle with pure visualization.